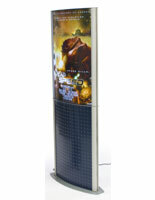 This Elegant Sign Supply That Displays Posters Comes With Illumination and A Transparent Overlay For Maximum Protection! Make Your Indoor Advertisements Really Stand Out With This Sign Supply! Don't simply exhibit your signs - exhibit them with style and flair! 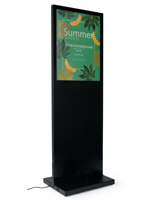 This contemporary sign supply for mounting signage is a fashionable option to traditional visual graphic holders with its curved exhibit and backlit illumination. 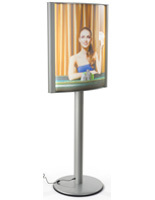 The sign supply, also recognized as a poster holding device is floor-standing and extremely well suited as a visual graphic frame for highly targeted locations like hotel foyers, cinemas, and shopping centers. The sign supply accommodates most 27-3/4" x 67" signs. To achieve the brightest display with this sign supply it is recommended that signs be printed on transparent or semi-transparent film like Duratrans. 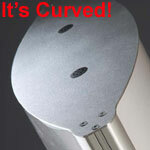 The ready to ship sign supply, a curved visual graphic frame also has backlit illumination. The poster holder comes standard with one 59" T8 neon bulb inserted between the PVC sheets and into the bulb holding device upon assembly. This individual bulb is sufficiently vibrant and supplies generous illumination to both sides of the sign supply. The product also comes with a 24 ft. power cord designed to work with any common three (3) prong electrical outlet. The sign supply is made up of an elite caliber anodized aluminum visual graphic frame alongside with an accompanying satin aluminum base. The base is weighted to stop the visual graphic frame exhibit from falling over. 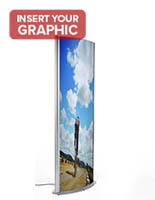 To achieve the curved graphic exhibit, two sheets of durable PVC are inserted into grooves on the sides of the visual graphic frame. 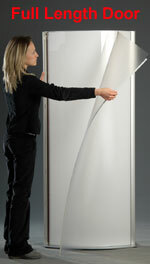 When fully inserted, these sheets bow outward, producing a convex visual graphic rack. 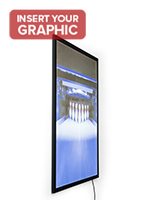 Your images are sheltered by a full-length transparent Lexan film, which attaches to the visual graphic frame on one side with adhesive and the other by magnet. 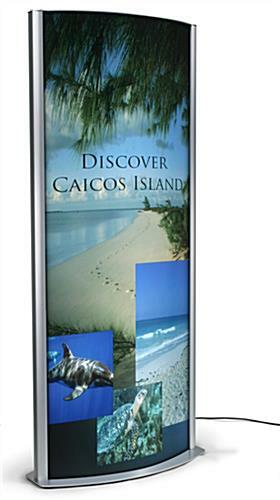 The magnetic strip permits you to open the versatile sign supply for posters just like a door, making the process of swapping out images fast and simple. 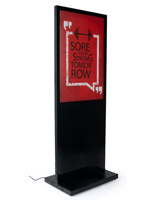 The premium sign supply with free-standing base sports a quick-clip frame, which makes changing the inserted graphics a breeze! To insert/take away poster holder images flick open one side of the snap exhibit, unpeel the magnetic edge of the Lexan visual graphic protector, and insert artwork into the graphic holding grips on the topside and bottom of the exhibit. Once the visual graphic is appropriately secured, reapply the magnetic edge of the poster frame and flick the snap borders closed. It's that simple! With its distinctive convex display and vibrant illumination, this sign supply is certain to grab the attention of everyone who passes by! Viewable Area: 26 1/2" x 67"
30.0" x 67.8" x 20.0"